1 set of matching acid-free foam board backings. Market kit 10 sets of A3 windowed Ultimate White Mats offset to fit 16x20"
Picture for illustrative purposes only. 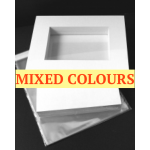 The co..
Market kit 10 sets of A3 windowed, Black Mats, offset, to fit 16x20"
Market kit 10 sets of A3 windowed Mixed colours Mats offset to fit 16x20"